State-of-the-art turbine controllers must meet the most stringent demands in terms of safety, economic efficiency, and availability. The basic requirements are a hardware platform suitable for industrial applications and the use of international standards. 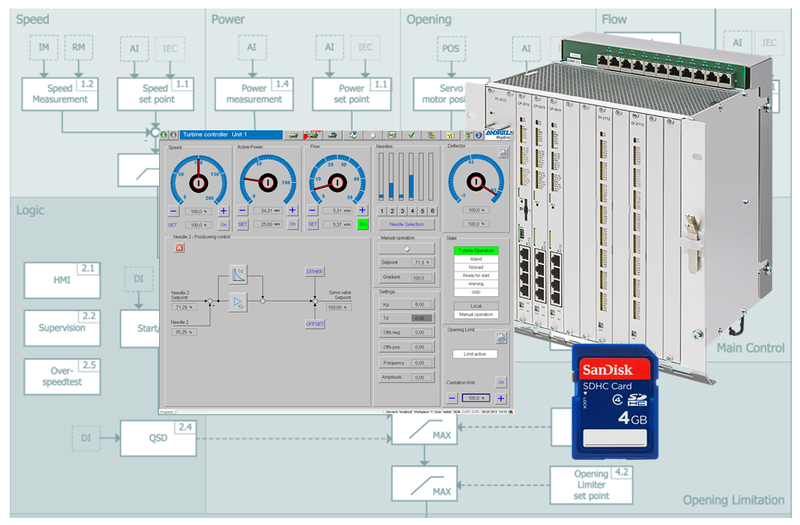 Operation of the turbine controller is easy with the latest graphical software interfaces. In addition, efficient remote functions are needed for fast and easy maintenance and service access. Operating reliability must be guaranteed under all service conditions, even with the most difficult ambient conditions (for example moisture, EMC. The sensor technology required to detect field signals should be designed to meet the highest standards. The speed sensors, some of which are redundant, and the drift-free positioning of the servo-motor must guarantee low-error, maintenance-free operation. In order to guarantee easy maintenance, the mechanical design should feature a modular structure that can also be extended. The turbine controller is as a main part of an unit used to convert the existing hydraulic energy to electrical energy on a most efficient way. It ensures a stable speed of the turbine in no-load-operation as well as island-mode and guarantees the adherence of setpoint in grid operation. The ongoing developed core algorithm copes with the increased challanges for the turbine controller with regards to frequency and primary controls. The requirements of the different turbine types (Francis, Kaplan or Pelton) and sizes of the units are supported by a modular application concept. In order to secure an easy interface to project specific requirements, the application board contains all types of in-/ output signals. Thus interfaces for speed sensors as well as generator voltage measurements for the speed measurement are foreseen. In addition analog in-/outputs for the measurement of positions and CT/VT interfaces are available. The analog outputs can be configured as voltage or current outputs with variable limits. If required an oscillating signal can be generated in order to support all types of servo valves. ANDRITZ HYDRO offers complete oil hydraulic power unit (HPU) packages including sump tank, pumps, control and main relay valves, filters, monitoring devices, and pressure accumulators. The standard concept has a modular design with use of reliable industrial components and design pressure up to 250 bar. Preferably we use self-regulating axial piston pumps for the main oil supply, but constant pumps (e.g. screw or gear type) with special pump control blocks can also be used. Special hydraulic features needed for the turbine control - like pump control blocks, failsafe function on main relay valves, special shape of control edges on main relay valves, etc. - have been developed in order to guarantee maximum reliability and safety. A series of standard, but tailor-made main relay valves are available for special applications on old low-pressure systems as well as on new turbines requiring high operating capacity. The hydraulic system is designed together with the actuating elements, both for new plants and rehabilitation projects. 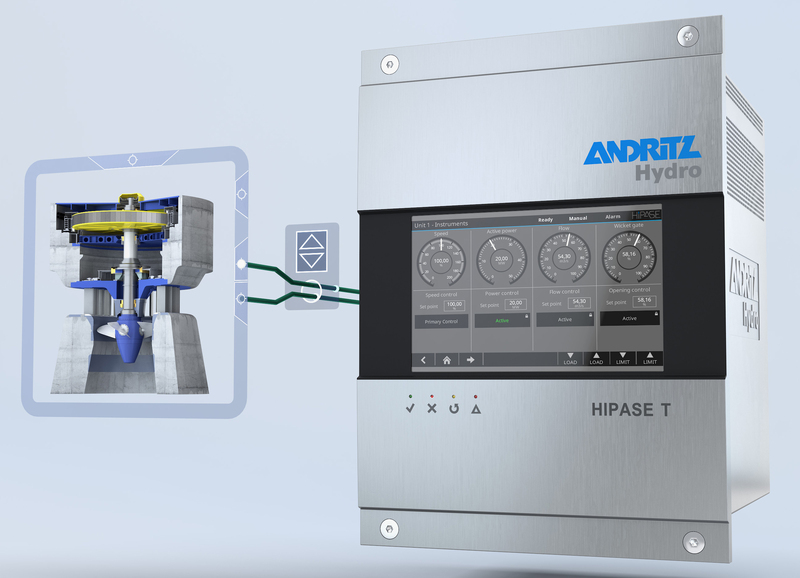 ANDRITZ HYDRO turbine governors stand for flexible and reliable turbine control. The new challenges on grid stability are faced by means of the load frequency algorithm. The high number of communication interfaces distinguishes the digital turbine governor TC1703 and TC1703XL, which makes operation and remote assistance easy to implement. Due to the various input and output modules, a wide range of sensors and actuators can be used together with the turbine governor, even when existing hydraulic components must be taken into account. The digital turbine governor gets by with the functional requirements of the client because of a scalable and modular solution. It can be implemented as stand-alone solution or as integrated part of the existing structure. Preceding simulations and stability studies ensure stable and reliable control. The governor performs different tasks during operation. Beginning with the start of the turbine on demand and stabilizing the speed for synchronization, it ensures stable load control when the unit is connected to the grid. Further tasks are supporting the grid frequency during primary control and fast reaction on load rejection and island detection. Due to the various requirements of the different operation modes, bump-less switching is vital for the turbine governor in order to provide safe and preserving operation. A variety of special functions are available related to the turbine type, e.g. Comprehensive operation with a high-resolution touch panel gives the operator the opportunity to interact with the turbine controller and to view all the status information on a central device. In addition, it allows local operation of the turbine within the defined limits. Comprehensive services, spare part guarantees, and training classes complete our scope of delivery.